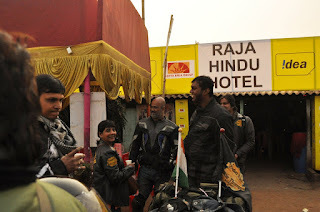 Starting from 16th January 2011, I went through my life’s Best Fortnight on my Bull – the TBTS, on the awesome Indian National Highways, for an 11 days’ of pure ride with purpose of attending the RM East 2011 at Kolkata and to live nomad life, with the civilization but the Highways’ way! As it for sure is none less than an epic of 5400 kilometers’ ride, I will be story telling it in 3 parts; 1st on ~2500 kilometers’ Mumbai to Kolkata ride, 2nd the RM East 2011 Event Days, 3rd describing an about 3000 km Quadra Ride from Kolkata to Mumbai via Varanasi, Agra and Jaipur. This part, being first in the series, is on Kolkata-Mumbai ride. Probably it’s the Indian mentality to wake up at eleventh hour and do all that can and cannot be done to be prepared for the event at its best! I don’t count myself amongst the lot, but at times I can’t really help. Though I started preparing for my grand ride to Kolkata for RM East 2011 well in advance; I had to get indulged in the last day’s preparation too. On Saturday morning, I received pair of Cramster gloves, and in evening I was riding to Mulund to buy the Saddle bag and Sleeping bag for the ride. My roommate invited his juniors for a party that night, and later had to postpone it for the sake of my sleep. I knew it would be some sleep that I won’t miss if get the opportunity to be a Ghumakkar on Highways! Inddiethumpers were scheduled to start the ride from the Dutta Snacks, Panvel at 6:00 AM, January 16, 2010. I reached the place a few minutes late, and left with the 3rd small group. We were total 13 riders on their Bulls, with two pillions; Guri pa ji and Jerry were riding with their wives. Our first day’s target was to reach or cross Sholapur, mine was also to befriend with guys. Rahul Upadhyaya is my Inddiethumpers’ mate; the guy with whom I joined this club, Prathmesh, has now moved on to Madras Bulls. Shyamal is the other guy I got little acquainted with at Rafeeque’s garage. Our first stop was somewhere after we crossed Hadapsar’s traffic on NH9. Ganesh asked me whether uncomfortable riding in close formation? I nodded; I can be assured of my riding but what about the one leading me! Well, later in trip I was in deed riding close by. We reached Sholapur at around 6:30 PM, and Vikram, Rahul and Guri pa ji arranged a dhaba-stay for the night. Few guys have brought their tents; others, including me, had to spend the night in sleeping bags on cot under the open sky, set along a bonfire! Awesomeness! One of the Bullets broke down at Sholapur; its floating-bush wore out. Kaka and Guri pa ji inspected the machine, and it was decided to send back. Next day, January 17th 2010, Inddiethumpers started from the Sholapur towards Hyderabad. NH 9 is awesome; Guri pa ji was cruising on the serpent roads at over 110kph, with his wife as pillion on his ol’ 500 cc Standard. Rahul, Ganesh and I were following him to our bests. I crossed 110kph at about 4500rpm in our first 100 kilometers ride of the day. En route we crossed Osmanabad, Karnataka. In Hyderabad, Lalit ji of Wanderers and his family was waiting for us. We visited their dhaba and garage too. There, Guri pa ji was garlanded by Lalit ji’s father, what a grand welcome we had! They arranged for us to stay in the Ramoji Film city. Hyderabad traffic was worse than what we met at Hadapsar. It was a tough task riding together inside the city, and we would have lost if we would not have guided by Wanderers. In fact Kaka and Shyamal parted from the group and reached Ramoji before us. One thing that I noticed throughout the ride through different cities, that no other city-dweller is as traffic-mannered as the Mumbaikers are. Elluru, Andhra Pradesh was our 18th January destination. It is a small town on NH5, the highway we started riding on from Vijaywada. It was the 2nd sleeping bag-tents’ night for us, and from here onwards we started feeling the dipping mercury. 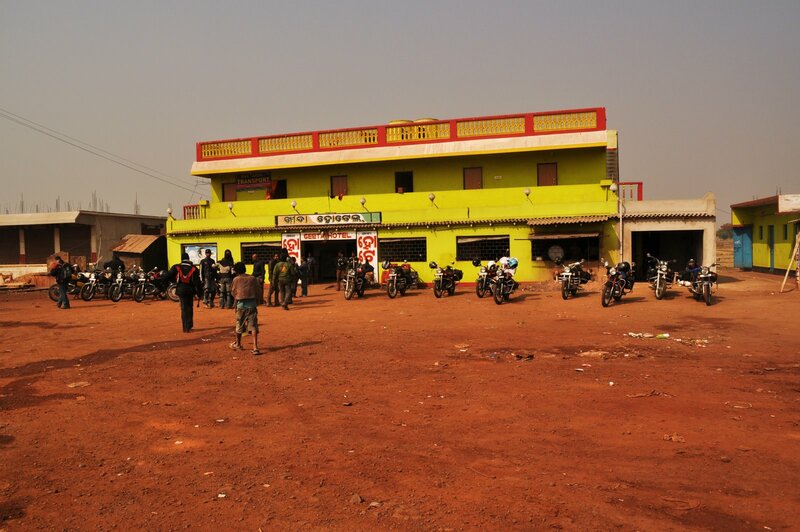 The dhaba-people were not able to speak/understand Hindi or English, but were too cordial to be mentioned! In fact, we were wandering in the town for a proper place to stay when an Inspector of Andhra Police lend his help and got us settled. Shouldn't I be clicked? He asked. It was a foggy morning on 19th, when we topped up our engines (with engine oil), and started ahead. It was our daily schedule to check engine oil and top up if required; fill the oil-tank to brim and discuss the last day’s mileage. Surprisingly, my TBTS gave a whooping mileage of over 60 kmpl on 18th Jan ride, which was also backed by Aditya’s TBTS. We suspected someone stole our engines and put Discover’s engine! :p Well, 19th January’s target was to reach Vishakhapatnam, some 400 kilometers due northeast. We took NH5 via Rajahmundry, and later came to know that other way via Khammam was rather bad though shorter. This was the day we discovered local-cigarette, called Chutta, no smoker of the group was able to smoke one complete Chutta. Due to some miscommunication, riding fast to catch up with Guri pa ji, who actually was behind me, I got well ahead of group and entered the city of Vishakhapatnam. Later, I had to ride back some 30 kilometers. It was a tough task to find a suitable budget-place for the stay. We first checked in to a literally lousy lodge, and later in to a rather good Hotel near State bus depot. There we met Inddiethumpers Team 1, who got stuck at the place because of bike break downs. Also, I met Ranjit Daval, the guy I first met in the Inddiethumpers 2011 Anniversary ride, and RM2011 ride plan day; who was planning like me to ride back to Mumbai via Agra-Jaipur. 20th January was our penultimate ride day for Mumbai-Kolkata route. Like all other days, it too was happening one. Aditya’s bike’s rear wheel started wobbling. He had to ride overcautiously till we reached Bhubaneswar, the Temple town of India. 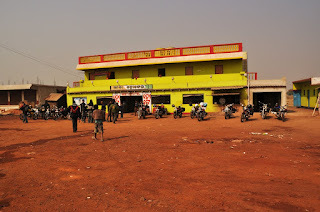 Till Icchapuram, a town at Andhra-Odisha border, NH 5 was in good shape; in Odisha though, in Berhampur it changed in to a bad shaped village road. For a moment, most of us were confused whether we are on right track or have strayed. By the time we could cross those patches, Sun had bade adieu for the day in west. Search for a good place to stay again started as we came nearer to the city. Apurva was the saviour this time. For Aditya, Abhijeet and Akhtar bhai exercised their mechanical skills, with helps from some local bullet riders who arranged all that was needed for the repair. I met Krishna, an old college friend, after over 2 years, at Vaani Vihar University at 1 AM. Ahhh, one more thing, riding along the Chilka was too a wonderful experience, though actually too short to entertain. May be some other time around, we’ll ride along Chilka and the East coast too. For the final ride-day, we were just about 450 kilometres short of our destination. As we started from Bhubaneswar, Aditya’s bike started wobbling again, and he had to stay back to get it properly fixed. Riding with our typical 80-90 kmph speed, we crossed Kharagpur at about 4 PM. As there were no good hotels/lodges to stay overnight at Kolkata outskirts, it was decided that we’ll spend the night at the venue itself. Few of the Inddiethumpers who reached the venue before us, gathered at the Main gate to accompany us while entering the Rider Mania X1- the RM East 2011, Lake Land Resort, Kolkata in grand Inddiethumpers’ way! And, not only we did it in the leadership of Guri pa ji enthralling every living soul present there to their awe, we also left an early-impression of what way we’re gonna enter the RM officially the next day. waiting for the next one....EAGERLY...!!! Awesome write up! Next one eagerly awaited! Thats a great post, you have given a real feel of the entire journey by giving so many fabulous pics, i loved it! hey sounds like a great advennture!! @Anu ji--yes, it was a life time experience, an adventure! puneet this is sikander (jry) appreciateing ur presentation good but sad yaar sikander is not to b seen anywhere next time only sikander all over.